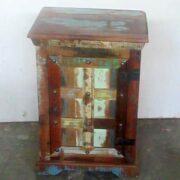 Side cabinet made using an architectural salvage door. 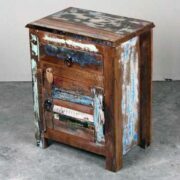 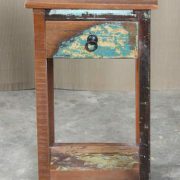 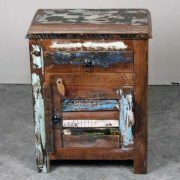 A charming vintage side cabinet made from reclaimed wood with an original architectural salvage door. 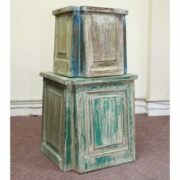 The cabinet has a distressed pastel light wash finish and the characterful door has particularly nice metal banding features. 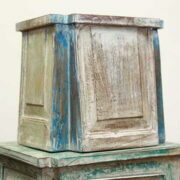 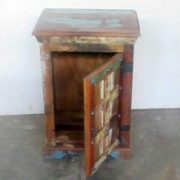 This unique cabinet captures the beauty and soul of the historic city of Jodphur in Rajasthan, N India. 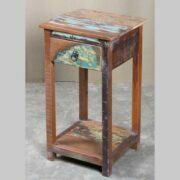 With one shelf inside, it’s a great side cabinet for a bedroom, living room, or hallway.